A fine setting with a timeless charm. 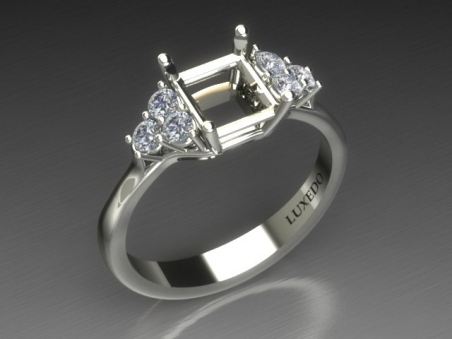 The central gemstone is embraced on both sides by three brilliant cut diamonds mounted on wire prongs. The stem section is slightly rounded for greater comfort. This model is suitable for gemstones over one carat with the following cuts: round-brilliant, oval, emerald (octagon), princess, radiant or marquise. Colour lot G, clarity VS, brilliant round cut, very good.